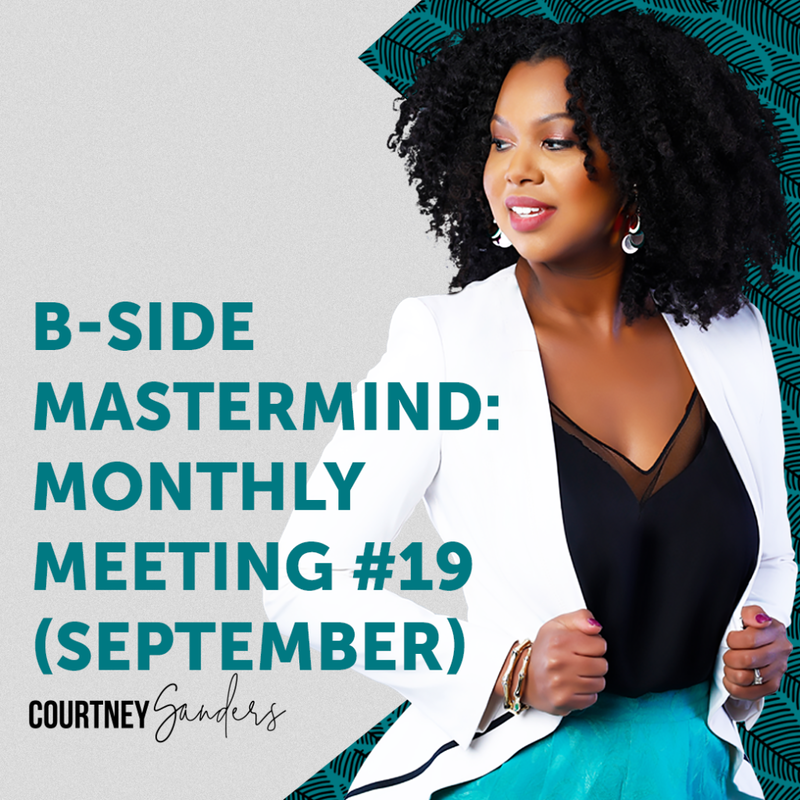 Hello and welcome to The B-Side, a mastermind group for entrepreneurial women! On the first of each month, I share my business-related goals, challenges, and triumphs while inviting you to do the same! I’d love for you to join me; you can learn more about participating by clicking here. Periscope regularly. Womp womp. I swear, I swear! I am going to get back on Periscope! It’s not that I don’t have anything to talk about but rather I have to wrap my brain around the fact that Periscope can be impromptu. Meaning…the reason I don’t ‘Scope as often as I want to is because I’m like, “Oh, I’ll wait until I go home, can sit in my office, get the write lighting, put on some lipstick…” etc, etc instead of just DOING it! Seriously, my goal is to ‘Scope at least 5x per week for the rest of this month. 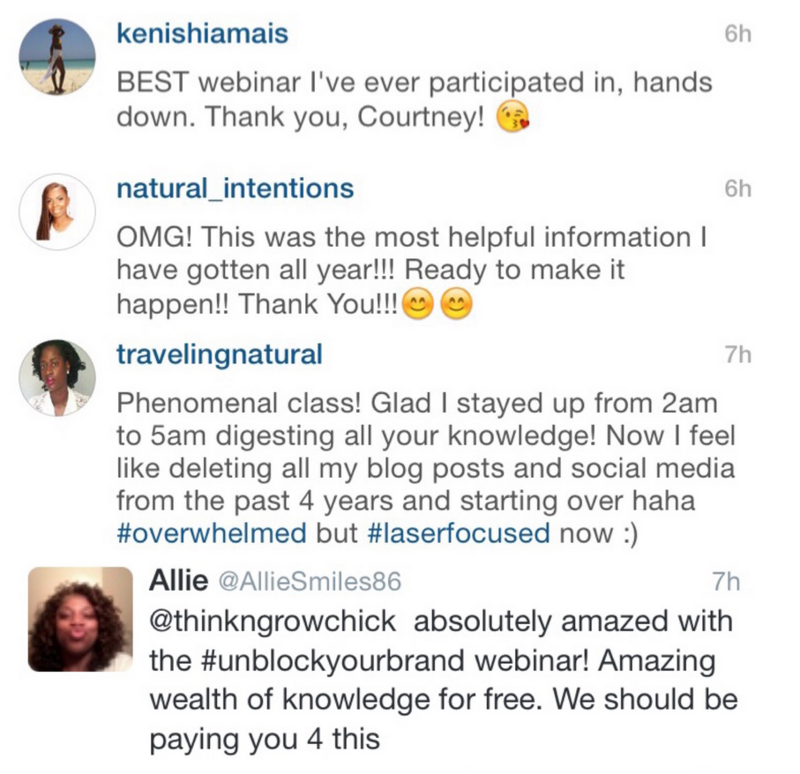 Focus on getting new clients. As the year continues to wind down, I’m thinking more and more about what activities I should focus on to really accelerate my results. Financially, hosting classes and workshops has been successful but the amount of work I have to put in to launch new programs is significant. I’m now thinking, in addition to building my product library, I should devote more focus to finding high paying clients. I’ve worked with 2 clients in July that paid me several hundred each to help with their website and marketing. While website stuff is not my passion, it is a skill I have that can accelerate my income growth so that ultimately, I can work for myself full-time. Since that is my #1 goal, I’m willing to do whatever it takes, as quickly as possible, so I am now going to take on more clients to get me to full-time entrepreneur status, faster. The dollar amounts individual clients are willing to pay for websites and internet marketing is simply higher than what I make selling classes and workshops at this time. (I keep my courses at a pretty affordable price point so that has a lot to do with it.) I LOVE hosting classes and workshops though, so I don’t plan to stop but I’m just going to leverage the lucrativeness of working with clients as I continue to build my workshop offering and grow my brand. Create content for my next paid program. While I’m branching out in terms of creating new revenue streams for myself (see goals #1 & #2) I still want to be known as having a library of personal development, money mindset, and business classes that change women’s lives! I want women to be able to come to my website and choose from 10 or 20 different courses and classes that will help them improve various life areas. As it stands now, I have 3 digital workshops available, all on the topic of online entrepreneurship, so I want to expand this and cover more topics. Thus, my goal this month is to create the content for a paid personal development class. Find 3 outfits for new photo shoot. Since I’ll be writing all these books and offering all these new classes, I need several professional photos to feature on the cover of all my upcoming content. While I love the pictures from my last photo shoot, it was just one look in an outdoor environment so I’d like more variety to use on my website and Kindle book covers. Specifically, I need photos with multiple looks on a white background, so my goal this month is to find 3 outfits I can use for a new photo shoot! Overthinking/Not Making it Easy. This was part of the challenge with my lack of Periscoping. I’m such a thinker, such a planner, such a “strategizer” that often times I make things waaaaaay more difficult than they need to be. My goal with everything this month and beyond is just get back to a place of jumping in and just doing things, not thinking about it too hard. While all of my goals will take effort, none of it has to be hard if I don’t want it to. Whether something is hard or easy is ultimately up to me! Share your goals, challenges and successes in the comments. The goal of this mastermind is to support each other, so be sure to read all the comments and check out all the participating blogs and businesses! If you have something to offer, leave a comment and help each other out!